śrautāṇāṁ karmaṇāṁ caiva sarvēṣāṁ ca pravartakaḥ..
Prostrations to Sage Gautama who is the creator of all beings and sages, and who performs sacred rituals like Yajña for the welfare of all beings! Sage Gautama was known for his unparalleled wisdom as well as for the power of his austerities. He was the son of Rāhughana, a family priest of the Kurus who belonged to the lineage of Aṁgiras. He shares his ancestry with Sage Bharadvāja. In fact, Bharadvāja was one of his famous disciples. 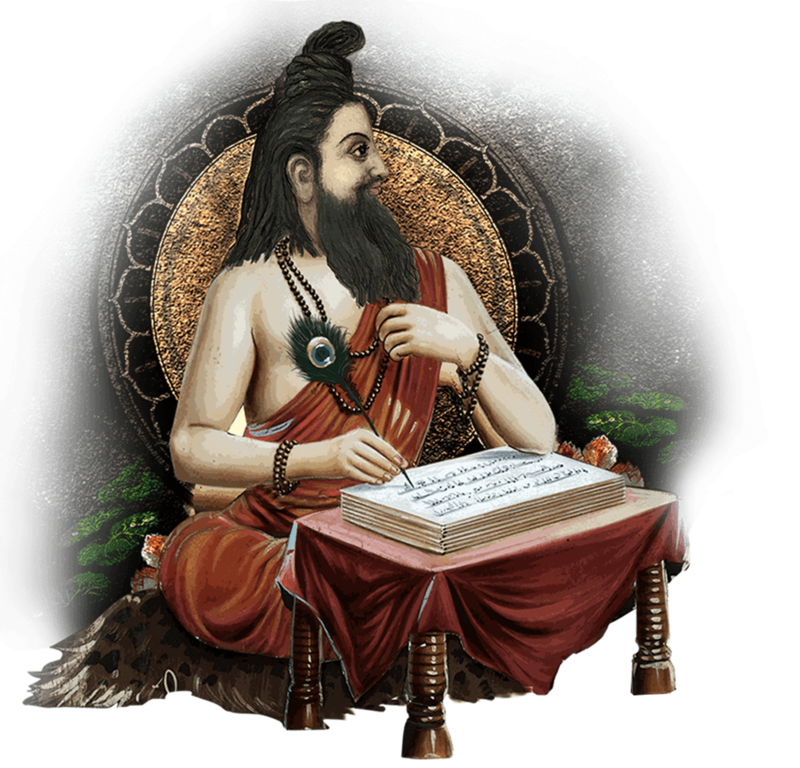 The wise sage had authored the Nyāya Sūtra, which deals with logic and reasoning, and the Dharma Sūtra, also known as the Gautama Saṁhitā. Both the greatest epics – the Rāmāyaṇa and the Mahābhārata – relate the story of the great sage as he lived through the two greatest Yugas – Trētā Yuga and Dwāpara Yuga. He had the most beautiful Apsara, Ahalyā, as his wife who was none other than the mind-born daughter of Lord Brahmā. So unparalleled was her beauty and charm that even the celestials longed to be with her. In fact, she was under the care of Sage Gautama when she was young. The sage raised her as per the instructions of Lord Brahmā; nevertheless, he never desired her, which pleased Lord Brahmā who eventually got them both married. Since then, the beautiful damsel remained faithful and devoted to the sage. The ascetic couple lived in a hermitage on the banks of River Ganga, performing austerities together. The sage is known for his curse that he unleashed upon his wife. Once, when he went to perform his daily rituals on the banks of River Ganga, Lord Indra visited his hermitage. Lord Indra was smitten by the beauty of Ahalyā that he approached her in the guise of the sage in order to attain her, thus making her believe that he was Sage Gautama. When the sage returned to his hermitage and saw them both together, he was greatly enraged and unleashed curses upon them. He cursed Ahalyā to remain as a stone near the hermitage, surviving only on air until Lord Rāma would come and liberate her from the curse. And since Lord Indra violated Ahalyā, Sage Gautama cursed him that he would be defeated by his enemies in a combat and would not remain as the ruler of the Devas for long. Because of the curse that he inflicted upon the two souls, Sage Gautama was deprived of the divine powers that he had acquired from performing austerities for thousands of years. He then went to the slopes of the Himalayas and continued with his austerities that lasted for years. Eventually, when Lord Rāma released Ahalyā from the effect of her curse, the sage returned to his hermitage, which remained deserted for years, and reunited with his wife. Since then, the ascetic couple lived peacefully, performing austerities and sacred rituals together. The holy sage is also known for his sixty-year long penance which is mentioned in the ‘Shānti Parva’ of the Mahābhārata. The Nārada Purāṇa describes the story of the great famine that lasted for twelve long years, during which the sage fed hundreds of Ṛṣis and saved their lives. He is thus well known for his selfless service to the beings in the universe.